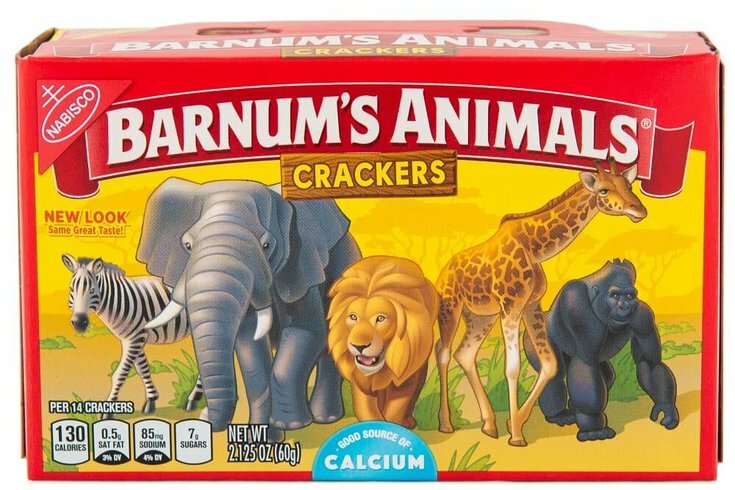 Nabisco redesigned its Barnum's Animals cracker box after PETA called for it to remove the bars and cages. Boxes of animal crackers will no longer display circus animals behind bars, after years of persistence from PETA. Mondelez International, Nabisco's parent company, did an entire redesign of the box so that the illustrated animals would no longer be depicted as caged circus performers on display, but instead wild animals that could run free in their natural habitats. PETA had been calling for the redesign since the spring of 2016 when it wrote a letter to Mondelez. “Given the egregious cruelty inherent in circuses that use animals and the public’s swelling opposition to the exploitation of animals used for entertainment, we urge Nabisco to update its packaging in order to show animals who are free to roam in their natural habitats,” PETA said in its letter, according to the Associated Press. The new boxes are now on U.S. store shelves, depicting a zebra, elephant, lion, giraffe and gorilla in a grassy plain with some trees and greenery in the background. The new box retains its familiar yellow and red colors and is sticking with the brand name, Barnum's Animals. The Barnum name is a nod to the 146-year-old circus, Ringling Brothers and Barnum and Bailey, which folded in May 2017 because of diminishing ticket sales.